A couple of years ago while wandering around Hand Works I had the opportunity to meet Jason and his family from Texas Heritage Woodworks. I know from my instagram and blog friends that many of you have also spent time with Jason. I enjoyed the brief time we talked and was struck with the quality of his workmanship. 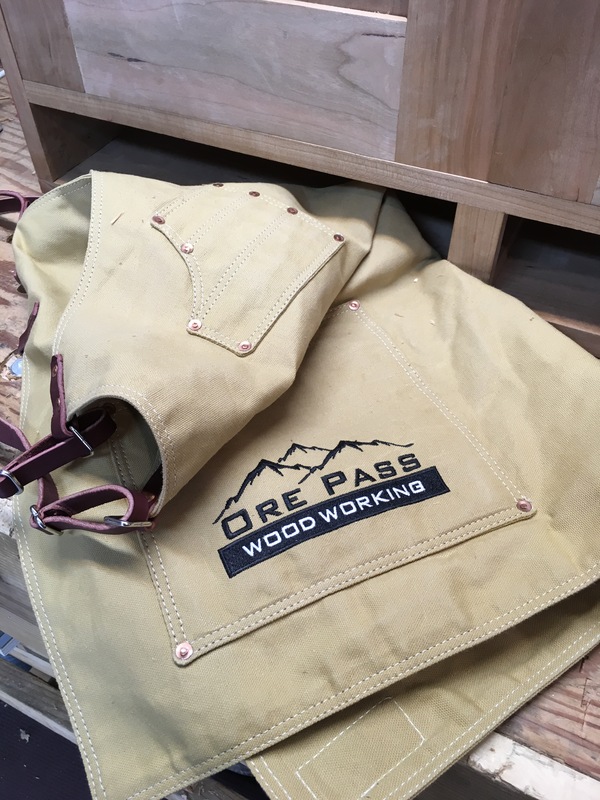 If you are looking for an apron, tool rolls, stickers or other items you can’t go wrong. Fortunately when my birthday came around a couple of months ago, Jason took time out of a very busy schedule to add a logo designed by my wife to one of his awesome aprons. I couldn’t be happier. There is something special about knowing the people who make the products you use. Jason, consider yourselves back door neighbors! A year or more ago I was given a dovetailed chest. If I recall it came from an officer on a Great Lakes freighter and was used to keep his personal items while on board. The chest measures 28″ long, 13″ deep and 11″ tall. When it was given to me the paint had been removed so the joints were easy to view. The trim is nailed around the top and bottom as are the bottom boards. The dovetails have quite an angle, more than I would typically use, but may be fun to try on a project. All of the hardware was in jars inside the chest including the lock. Inside the chest there is a definite tinge of red so i assume that it may have been the original color, at least inside. Also the hinge locations have been moved and new mortises installed at one time. I’m debating what to do with the chest. It seems that I should repaint it to keep it in fair condition, possibly with milk paint. Lastly I wonder at the story of this chest, the travels across the lakes and the owner.